This is a special spectral measuring system with a 25mm beam light. And also, it has complete functions and a unique built-in high efficient grating spectrometer. 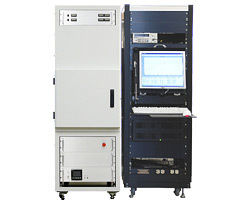 with complete function and featuring a unique built-in high efficiency grating spectrometer developed by Soma Optics. Achieving wide range of wavelength from 300 to 2,000nm using Xenon/Halogen lamp system. It is able to measure various kinds of solar cell types including silicon, chemical and next generation multi-junction cells.